There are quite a few details that go into planning even the simplest of weddings. From the chairs that are rented to the font used on the invitations, those small details can prove to be agonizing for any couple ready to tie the knot. One of the details that most couples (okay, really just the bride) look forward to is the choice of the flowers! Walking into a florist’s shop can prove to be magical, with beautiful types of flowers all over the place that are just bursting with vibrant colors. Before you let the fragrance of flowers take you to the nearest bouquet, you might be astounding to hear just how expensive those romantic roses can be. Don’t be distraught and consider flowers out of the picture for your wedding. There are actually a lot of ways affordable flowers can be found, so check out these tips to reduce budgetary strains. 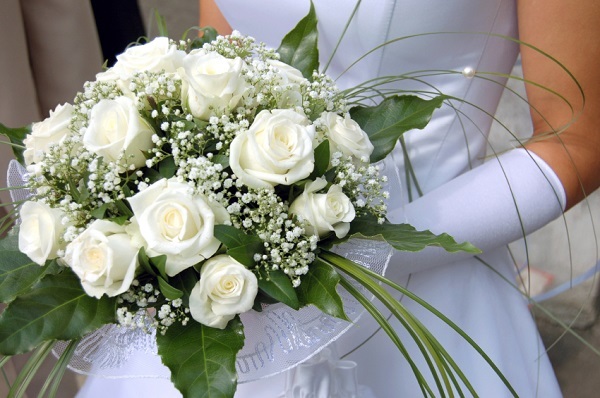 If you must hire a florist for your wedding flowers, then hire someone that is local rather than a huge chain company. A lot of people think that the local companies will be more expensive, but this is actually not the case! Most companies that are locally imbedded within the community will offer great pricing and much better service than you’d get at the big chain store. The people who run these shops can also come up with some beautiful arrangements, especially if they have been in the flower business for a long time. Before you completely skip over this tip, take into consideration that faux flowers are now more realistic than ever. In fact, most people won’t be able to tell that the flowers are fake unless they actually touch them! These are extremely affordable and there are all types of flowers out there to choose from. By using silk flowers you can end up being able to have a lot of them at your wedding instead of just a few real bouquets or arrangements. So you really really don’t want all those fake flowers; what is another option? Mix and match faux and real flowers! This can save an incredible amount of money and result in flower arrangements still looking absolutely beautiful. You can mix fake in with real or you can even have your centerpieces real while the flowers at your ceremony are faux. It’s completely up to you to do this, but at least consider it! Do you have a friend or family member that has a green thumb? Or do you know someone that is particularly good with creative design? If so, ask them to arrange your bouquets for you as a wedding gift! You could even do this yourself, as there are a lot of great resources online that will give you all the details for how to arrange different bouquets. Thousands of dollars can be saved by purchasing in bulk rather than per arranged bouquet, which can mean getting the flowers you really wanted. Take a deep breath and enjoy the wedding planning process, even those small details you wish you could do without. Flowers can be an enjoyable detail, but make sure you don’t completely blow your budget on them. After all, flowers are only going to be there for the day, but the memories will last you a lifetime!